Bang on a Can Marathon: 9 hours of New Music in a new home this Sunday | Will You Miss Me When I'm Gone? This Sunday is a special day. Yes, it’s Father’s Day, but that’s not it. Sunday is also the day that Bang on a Can is throwing its big, genre-bending musical party for New York City — the Bang on a Can Marathon. Mark your calendar and don’t miss it. 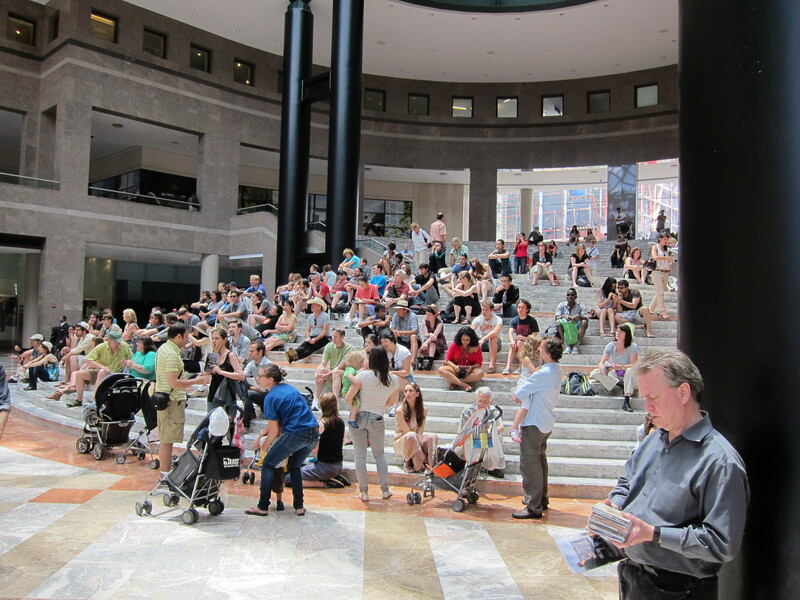 But don’t head to the Winter Garden at the World Financial Center, where the free marathon New Music concert has been held for the last few years. From 1-10 pm on Sunday (be sure to take Dad to brunch early and then bring him along to the show afterward), Bang on a Can will fill Pace University’s Michael Schimmel Center for the Arts at 3 Spruce Street with nine hours of music — some of it familiar, some you’ve probably never heard before. It’s the kickoff event of the River to River Festival, one of the city’s great free performing-arts series. Bang on a Can had to move the marathon this year because the Winter Garden is under construction. The Schimmel Center is a smaller venue, a concert hall with fixed seating rather than a mall atrium with open, casual seating. So that means changes in the format. 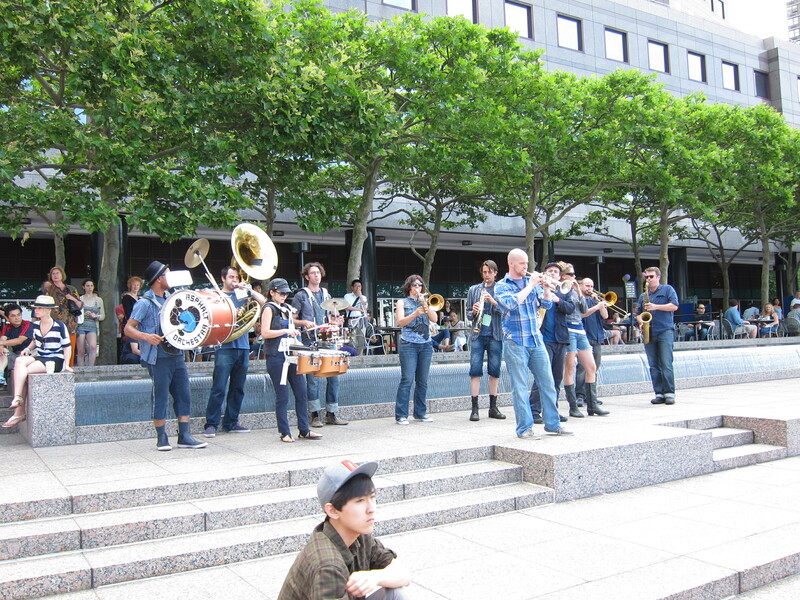 Asphalt Orchestra performing at the 2011 Bang on a Can Marathon. For starters, you’ll need to get a free seating pass before you go in to sample the sounds. That’s just so the organizers can make sure the audience never exceeds the capacity of the 743-seat hall. They’ll be handing out the passing starting at noon — an hour before the first onstage event — on a first-come, first-served basis, so get there early to snag a good seat. In addition to listening to the music, be sure to jump in on Twitter, too, by following on @bangonacan. While most of the action is in the hall, if you get there early, you’ll encounter Bang on a Can’s Found Sound Nation. From noon until 5 pm, it’ll be operating its Street Studio, where anyone who wants to give it a try can create and record original music. Look for it at Park Row and Spruce Street. Check out the full schedule after the jump. Bang on a Can returns to lower Manhattan’s River to River Festival with its annual incomparable super-mix of boundary-busting music from around the corner and around the globe. Co-presented by LMCC and Pace University as part of the River To River Festival 2013. Starting at 12 noon till 5pm, Bang on a Can’s Found Sound Nation will host its unique Street Studio: a mobile recording studio equipped for passersby and Marathon musicians alike to spontaneously create and record original music. The Street Studio will be stationed just in front of Pace University on Park Row & Spruce Street. This entry was posted in Concerts, Contemporary, Contemporary Classical, Music, News, Recordings, World Music and tagged Alarm Will Sound, Angélica Negrón, Annea Lockwood, Asphalt Orchestra, Bang on a Can, Bang on a Can All-Stars, Bang on a Can Marathon, Ben Reimer, Brooklyn Youth Chorus, Cabaret Contemporain, Caleb Burhans, Charlie Piper, David Cossin, David Lang, Derek Bermel, Hans Abrahamsen, Hotel Elefant, Jeffrey Brooks, John King, Julia Wolfe, Kendall Williams, Lukas Ligeti, Maya Beiser, Michael Gordon, Michael Schimmel Center for the Arts, Monica Germino, Nico Muhly, NYU Contemporary Music Ensemble / NYUSTEEL, Pace University, Peter Evans, Provenance Project Band, River to River Festival, Shara Worden, Talea Ensemble, Talk Normal, Tamar Muskal, Tatsuya Yoshida, Tom Zé, Yungchen Llamo and Anton Batagov. Bookmark the permalink. Smaller venue and required seating passes are two terrible developments.